His work includes architecture, furniture, textiles and glassware. 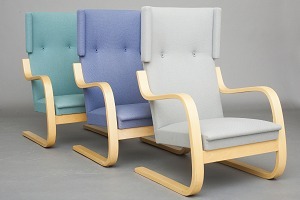 Aalto's early career runs in parallel with the rapid economic growth and industrialization of Finland during the first half of the twentieth century and many of his clients were industrialists; among these were the Ahlström-Gullichsen family. The span of his career, from the 1920s to the 1970s, is reflected in the styles of his work, ranging from Nordic Classicism of the early work, to a rational International Style Modernism during the 1930s to a more organic modernist style from the 1940s onwards. What is typical for his entire career, however, is a concern for design as a Gesamtkunstwerk, a total work of art; whereby he together with his first wife Aino Aalto would design not just the building, but give special treatments to the interior surfaces and design furniture, lamps, furnishings and glassware. The Alvar Aalto Museum, is designed by Aalto himself, located in what is regarded as his home town Jyväskylä.